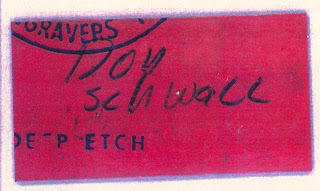 Friend o' the Archive John Moran was kind enough to send along a Red Sox wrapper from the 1967 Sticker issue recently discussed here. 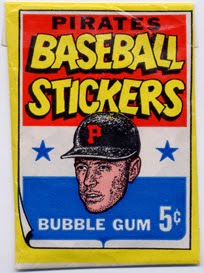 Where the Pirates wrapper showed a pretty good likeness of Bill Mazeroski, the Red Sox pack displayed an unmistakable Carl Yastrzemski who was playing the last Triple Crown season MLB has seen. It's got a bit of a tilt to it, doesn't it? I really like the poetic license taken with Maz and Yaz for the two wrappers! 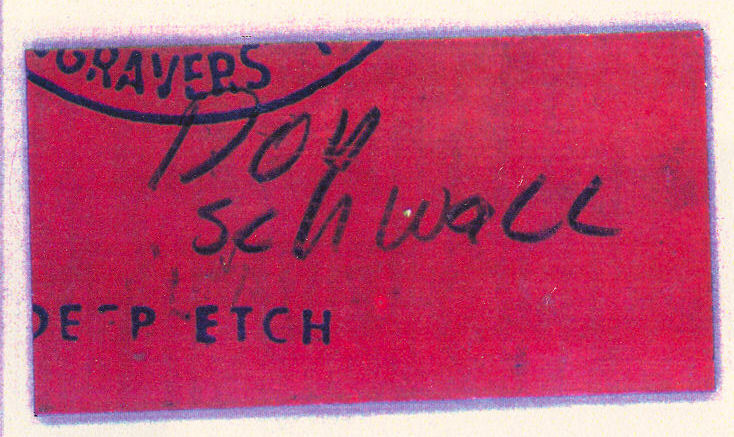 The back has Don Schwall scrawled on it but I think it looks like Yaz. So did the guy who sent the scans to me years ago (forgot your name buddy, sorry). I don't think that's our man. 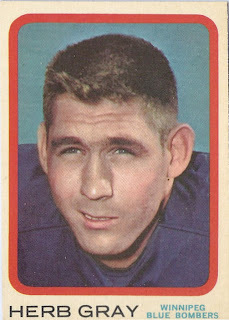 By the way, Don Schwall was one heck of an athlete, was the 1961 AL Rookie of the Year and won the first game in Atlanta Braves history. Click on the link, you'll see! So is the "Yaz" a red herring? I don't think he is but if you know what the engraving is, drop the Archive a line. We are going to (almost) wrap up the Topps Baseball Discs folks but a funny thing happened on the way to this post-I discovered the 1967's were probably proofed and printed up in late 1966. 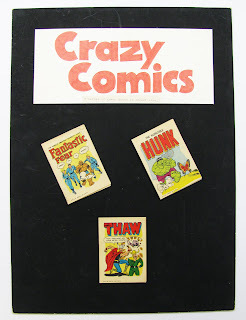 This follows a pattern found with the 1967 Punchouts, another set that went through what seems like a two year proofing process.  The 68 Discs in turn look to have been proofed in 1967. 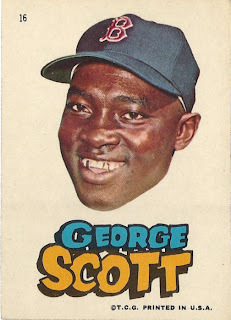 The 1967 set is comprised of 24 subjects and is sometime known as the "Silver Foil" set as the waste area beyond the circle with the player photo and information is silver reflective paper. Almost certainly designed to be pinbacks, these were to have been manufactured in Japan from Topps artwork and then imported into the US, a key bit of detail we will return to later. 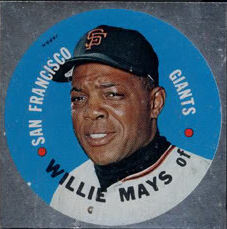 The '67 San Francisco Giants team discs also have the same back. 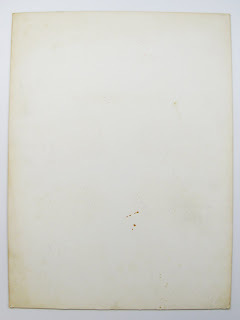 The 1968 Discs, which add four subject to the mix for a total of 28, can be found with both Silver Foil and Plain White backgrounds, the latter of which usually sometimes have a horizontal fold that may indicate a sheet being saved by a dumpster diver of decades past. 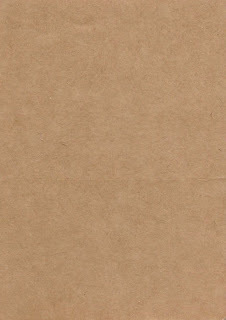 I am not sure if the back is the same brown cardboard found on the 67's but suspect it is. 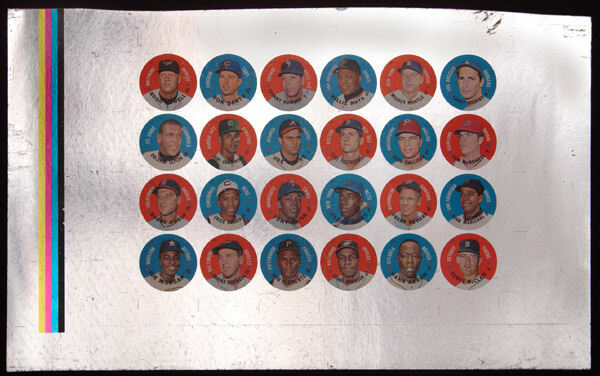 That's one of the things about the 68's-they are appreciably rarer than the 67's, despite what PSA and Beckett say and I have not been able to find scans of either a full proof sheet nor all of the individual discs from 1968. 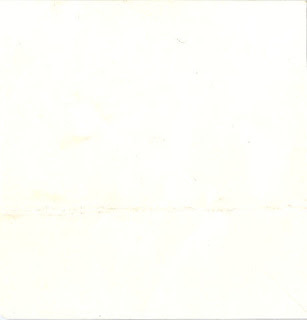 As you will see below, they have the JAPAN notation as well. 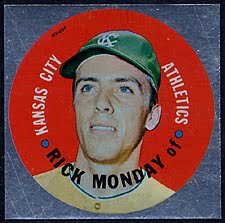 Having said that, the Monday disc really convinces me the All Stars were designed to be one set issued in 1967 as the A's were still in KC that year. The 68's should really be thought of as a second run of proofs. There's a little more on the production cycle further below but I will continue to use the commonly accepted dates for these two sets. In order to simplify matters, here is another list showing just the All Stars from both years with their team affiliations. Eleven players appear in both sets and a further post will try to differentiate years for these players as I do not have scans for all the doubled up 68's. 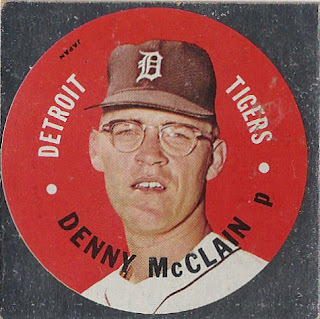 I'll also show how the photos used on the discs tie in to the 1967 Punchouts and 1968 Baseball Plaks Checklists among other things when that post gets written. * Tommy Davis should be with the Mets in the '68 set as he would be the only one in that set and each team has at least one representative. 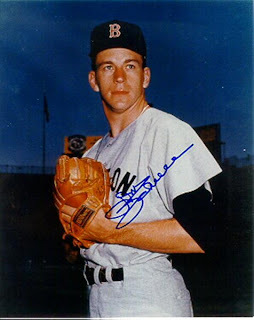 He was traded by the Mets to the White Sox on 12/15/67. See further comments below on last possible production date. ** Johnny Romano was traded from the White Sox to the Cardinals on 12/14/66. 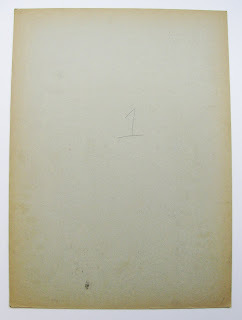 This indicates the first batch of proofs were almost certainly prepared prior to that date. The production cycle for both sets looks to have less than a full year as the A's were given permission to move to Oakland by the American League on 10/18/67. A set that was in process in December of 1966 was certainly intended for release at the start of the '67 baseball season in any event and would seemingly have concluded production by the time the A's were given the go ahead to relocate just after the end of the 1967 World Series. If you are counting teams the AL and NL had 12 discs each in the 67 All Stars and 14 in the 68's, color coded Red (AL) and Blue (NL). 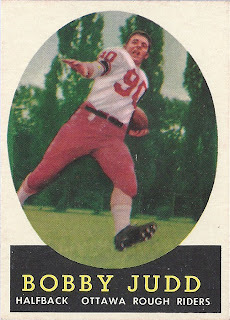 As noted above with the 1968 Tommy Davis Disc, each team had at least one player in each set. In 1967 the Orioles had a total of three players shown in the AL and the Braves and Giants each had an extra representative on the NL side. In 1968 The Orioles and Tigers each had an extra man while the Twins had two more than most. The '68 NL squad had the Braves and Giants again with an extra player each and the Pirates had a surplus of two. I am calling the players All Stars but it doesn't mean they made the mid-season classic in '66, some guys did it before, during and after that season. A few were only one time All Stars and the "scrubinee" player selection seems a bit odd. Perhaps more players would have been added later. So with all this effort,what happened, why did the pin sets never materialize? Well, I found an old reference to import duty suit filed by Topps to try to have the pins classified as "buttons" vs their being labeled "novelties" (don't quote me on that, I may have it reversed). I lost the link but seem to recall a 10% import duty for one category vs 35% on the other hanging in the balance. I believe Topps finally lost the case in 1971 and have to think the difference in nomenclature was enough to kill any potential profit margin on products imported from Japan for sale in the US under the more expensive duty assessment. If I find the link again, I'll post it down the road. 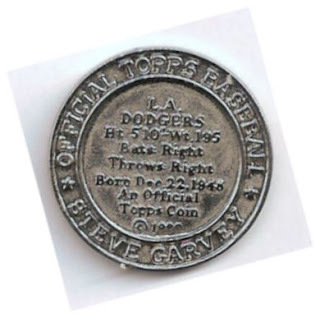 Topps had produced metal coin inserts in 1964 and would do so again in 1971, presumably in the US, so I wonder if this was an attempt on their part to manufacture certain items more cheaply in Japan. I believe a couple of non-sports pin sets were made in Japan around this time but would have to dig a bit to determine which ones. 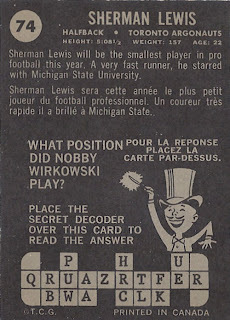 If you have any 1968 disc scans of any of the eleven repeated players, please send 'em along! Last time out I took a look at the 1967 Pirates and Red Sox Stickers that Topps was marketing to see if team-oriented products would sell. Obviously the answer was no but the stickers were well made and thought out. So well thought out that there was, in fact, a third team oriented set on the drawing board in '67. Some background is in order first though. I'll save details for the next post but the 68's can be found in various states of production with different backgrounds to boot. We again have a "silver foil" background with an incomplete color process (Herman would be green on the final proof run). 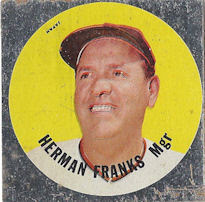 By the way, Franks had a strange career as player and manager, showing almost a pattern of punctuated equilibrium in his playing and managerial records. He even managed to hit for a career average below the Mendoza Line. Unlike the stickers, the SF Giants discs were never sold at retail and are very difficult to find these days. 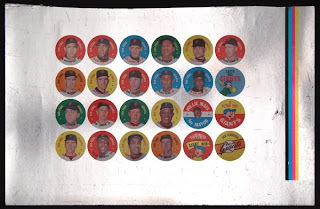 I count four hall of famers in the set and you also have the extra Willie Mays for Mayor disc to make sure a bunch of high end items end up on HOF collectors wantlists. Too bad these never made it to the store shelves. 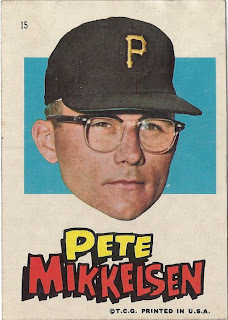 1967 was the year that Topps really started pouring it on. 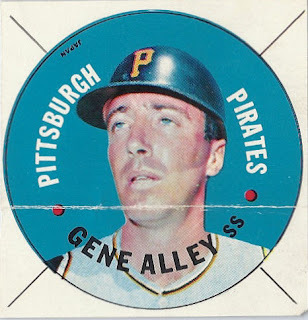 Whether it was due to their purchase of Fleer's baseball player contracts the year earlier or having run through a full production cycle at their new Duryea, PA plant, baseball related sets or planned sets were numerous in the Summer of Love.  They also started heavy experimentation with the medium of the product itself across all lines of cards. Also in the mix were four players in the Who Am I? set and a Babe Ruth Comic Book Foldee appearance. 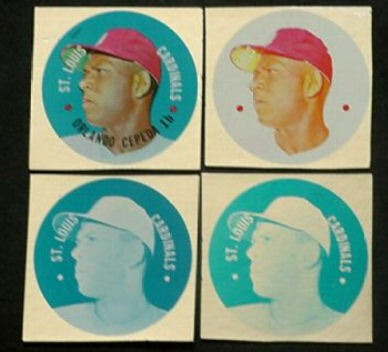 There is also the matter of the mysterious Roberto Clemente Poster Sticker. Whew! Today though, let's briefly focus on the two sticker sets. 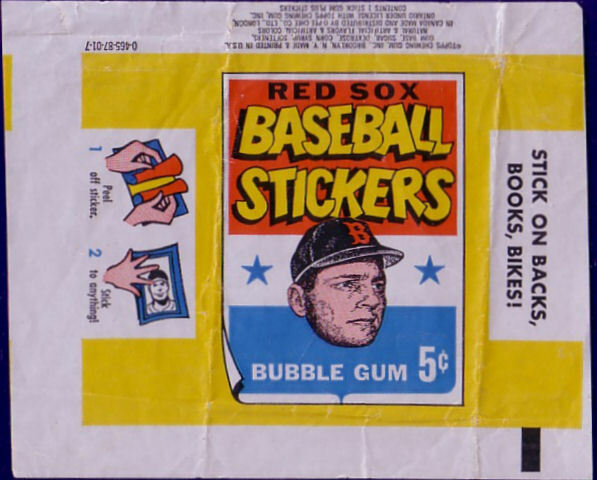 While not common, since I suspect leftover stickers were sold through the Card Collector's Company, the stickers are getting a bit tougher to find these days, like many mid 60's Topps small sets and inserts. 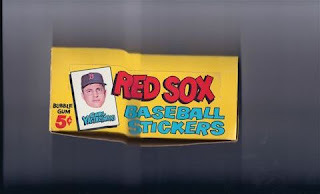 Don't get me wrong, these still are out there but they exist in reasonably small numbers compared to the regular baseball cards. I would like to get some more box scans up but they are scarce, with the wrappers not too far behind. The Stickers featured either 24 players and coaches (Pirates) or 26 (Red Sox) and then rounded out their numbers with some logo, slogan and fun cards, which I will get into next time for reasons that will be made apparent. Sorry to be a tease! 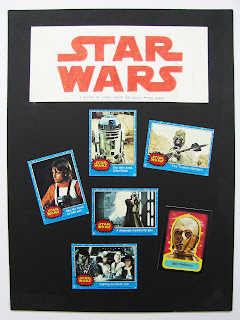 Pursuant to our last installment, the missing Star Wars presentation board reappeared on my radar and I thought it had enough going for it, I could devote a full, if short post to it as we clean up following our "March Hurricane" here at the main Topps Archives Research Complex. The missing board (missing because it did not have "Topps" in the title description on Ebay and I couldn't find it again until a helpful reader pointed me in the right direction) again being auctioned by BMW Sportscards actually was for a packaging concept for the sequel to everybody's favorite space western. 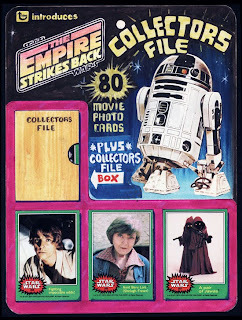 The Empire Strikes Back was also a massive success at the box office and on the candy store shelves. A couple of threads to update today kiddies, namely 1952 High Numbers and 1980 Baseball Coins, with a wide and wild detour back to Presentation Boards. 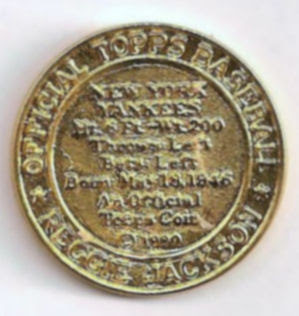 I have tabulated responses to my query on a few online forums that was cleverly titled "Where Did You Buy 1952 Topps Baseball High Numbers as a Kid?" The results were mostly supportive of my distribution theories but the sample size is way too small to cement anything except distribution may have been a little wider than I thought. Confirmed purchases took place in a suburb of Toronto (nice to have that verified), Eastern Massachusetts (presumably Boston or environs), Elizabeth and Jersey City, New Jersey (both just across the North River from Manhattan), Ridley Park, Pennsylvania (a Phildadelphia suburb) and near the Smoky Mountains in North Carolina. These were late summer/fall 1952 purchases from what I can gather. North Carolina is interesting as it is well past the MLB territory of the time and gets us into the true South. 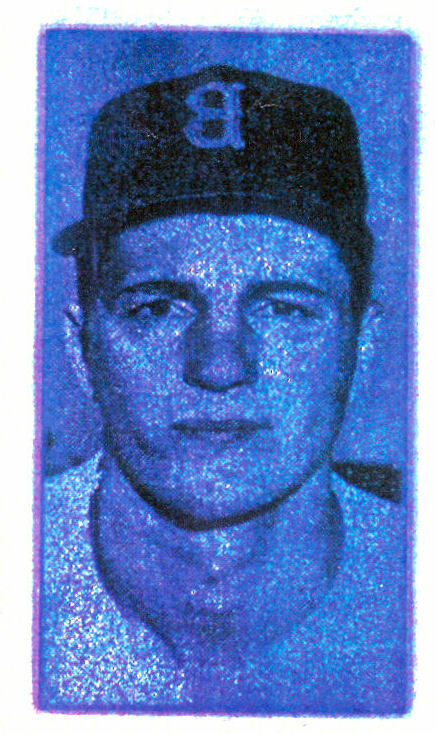 Looking westward, substantive purchases (two full runs from packs) were made by Roger Neufeldt of Sports Memories (one of the nicest guys you will ever meet) and whom I believe lived in Oklahoma City at the time of purchase (1952). That's farther afield than I would have thought and may demonstrate the spotty distribution the highs had in '52. Stabbing further westward we have Los Angeles, seemingly much later in 1952 and Rialto, CA,a San Bernardino 'burb in 1953 at a Rexall drug store (they had thousands of stores nationwide at the time) which is a connection I want to explore further as it may have something to do with the distribution of the cards. Woolworth's was allso a big seller of Topps 1952 baseball but I am not sure about their relationship with the high numbers. There were also numerous stories of people not being able to find them in their neighborhoods after being able to find semi-highs. I did not track (yet) where they could not be found however but do note one such place was Buffalo, New York which I had previously theorized may hot have gotten the highs in '52. There are also recollections of people buying the cards in 1953 wrapper sbut getting fistfuls of 52's. This brings up three good points: 1) Every account I have read involves highs from '52 only being bought in nickel packs, so were they sold in penny packs that year? 2) Does this explain why there are dated and undated wrappers (penny and nickel variants exist for each year) from 1953-55? 3) Did Topps therefore consistently "reload" the previous year's high numbers in current packs during this time and if so, why? All we need for a full player/metal Master Set is a Silver Jackson and Gold Carew and Garvey. Still no word on which ones have punch holes though. 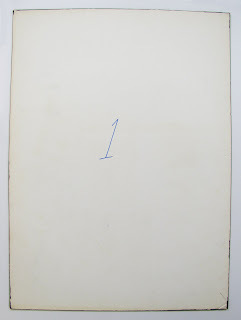 The numeral "1" makes a lot of sense as these would have been placed on large easels and handled manually, so an order of presentation would need to be established. Sorry I missed out on grabbing a scan of the fourth board but ya snooze ya lose! 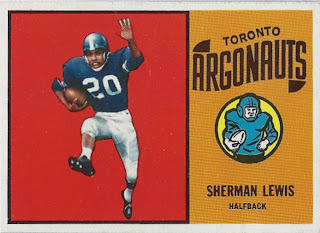 We're back, with a second installment of the Topps Canadian Football League issues. This time, we'll take a peek at the last four years of Topps branded cards. 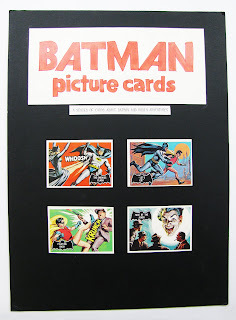 Yes, these cards were actually minis when separated-yikes! 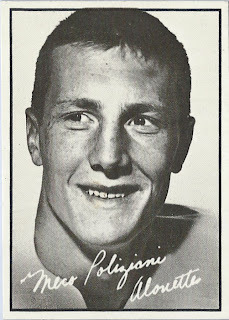 While the 1962 Topps US football cards do have a small b&w picture they in no way resemble these. 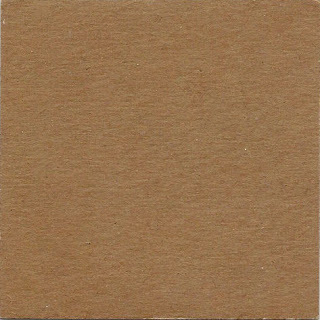 Issued in a series of 169 small cards, some are repeated with different partners on the larger "panels". I cannot find a reference showing how many different panels exist but would think 132 is a possibility. The mystery should be solved soon though as a top notch CFL card price guide is about to be issued (that link will work by the end of March 2010 by the way but you can contact the author now for more information: amalycky@telusplanet.net ). 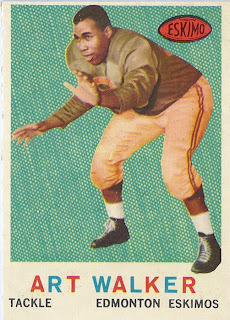 A nice clean, simple design with a large picture area always works wonders on a set of cards, although these are a bit austere compared to what was going on south of the border in '63, where Topps was starting to use some daring designs on their FB cards (we'll get to those eventually, no worries) although it would take them a couple of years to get fully revved up. 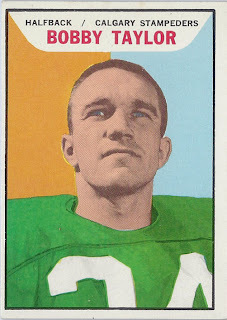 88 CFL cards were issued in 1963 , so we are seeing a decline in production and I have to believe that the cards were not selling all that briskly. Indeed the attendance at CFL games with their smaller stadiums in this era was less than that in the US by more than half on a per game basis and there are just not as many Canadians as there are Americans, so the numbers may not have been adding up too well for the bean counters. Those closely mirror the US reverses and you needed some red cello paper to check the quiz answer. 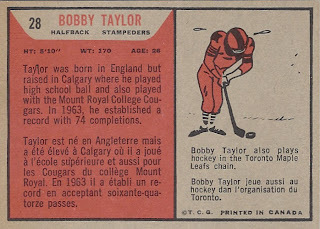 and actually share some design elements with the 1964 Topps hockey cards and 1965 US football cards, which are both infamous "tallboy" sets. 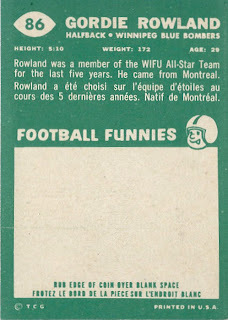 Topps would return to Canadian Football in 1968 and haltingly issue CFL cards for a few more years through its O-Pee-Chee arm. 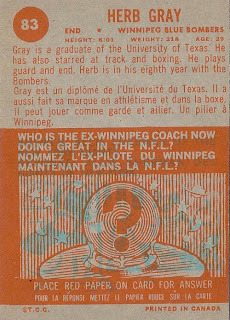 We'll take a look at the OPC cards real soon but will be back with a post on the 1960's CFL inserts before then. No, this is not a hockey post! 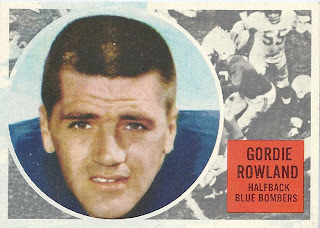 Today we turn our eyes to the sometimes Frozen North and start looking at an eight year run of Canadian Football League cards produced by Topps. 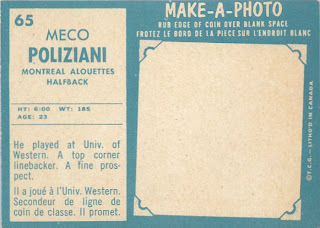 It comes as a surprise to many folks that Topps produced CFL cards but starting in 1958, when the league was founded in a forging of powerful east and west factions that were themselves outgrowths of an even older Rugby league, they were there all the while to document the players. 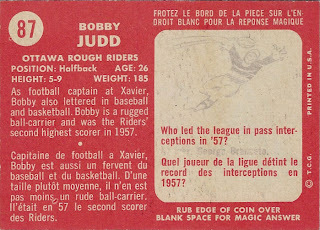 Now, you may have your opinions about how 110 yard fields and 3 downs make it a different game (among other things) and I certainly have mine but CFL ball is pretty close to the brand played in the NFL and the CFL cards, at least initially, were also pretty close in appearance to their NFL counterparts. 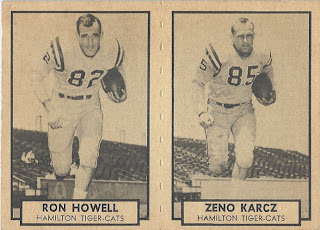 Since the CFL season starts about three months prior to the NFL's, the decision to make the cards look the same on both sides of the border must have been made in the winter of 1958. White background cards in each set have black information blocks while cards with different colors don't have this distinctive two-tone look. 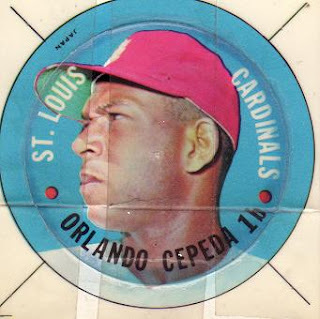 You can also see how the oval player photo led to the design of 1959 Topps baseball cards with their circular photo. I am going to run a series of posts on both design similarities across sets and year-to-year comparisons across countries over the spring, so hang tight! 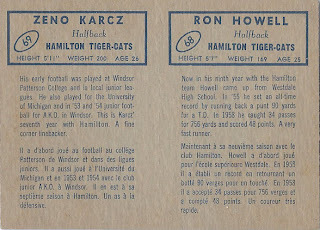 Backs once again are very similar to but not quite a hundred percent match with the NFL cards and French and English co-exist. 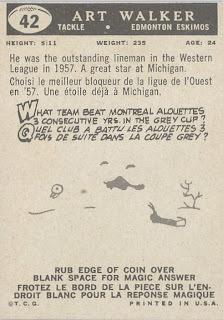 The Grey Cup, mentioned in the cartoon above, predates the professional league that now plays for it, much like the Stanley Cup does in hockey. I really like the idea of the championship game being contested for possession of a trophy that the winning team gets to display and then literally protect and wonder why the US sports of baseball, football and basketball did not follow this lead considering the history of the America's Cup. Meco's name really adds some Italian flair and almost makes this reverse trilingual! Next time out we will see even more dramatic changes-stay tuned! 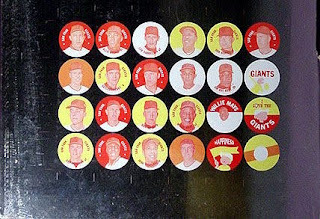 My recent posts on the 1980 Topps Baseball Coins have generated the most interest of anything blogged about here since the 1966 Punchboards had their checklist inflated out of the blue a while back. I'm a little surprised at all the attention but these are pretty rare birds after all and we are not done with them quite yet as another surprise is in store. Shown are a front and reverse each of the gold Jackson and silver Garvey we saw here last time out, held on with double sided tape when purchased by our present lucky owner. This particular one predates the Scott Gaynor buyout of a former Topps sales rep earlier this century as it was purchased in 1995, at a flea market no less! There is a credible report of a silver Carew and a possible third bronze Reggie. Some have a hole punched in the top, and I will post scans of these if I can get them. I am thinking there have to be at least two of each coin produced so a front and back could have been mounted for the pitch but still don't know if each is player minted in each type of metal, especially since only the Bronze run features all three at present. So we still would like to find a silver Jackson and gold Carew and Garvey. Given possible mixes and matches in the presentation, I think about four of each metal/player would have been produced in this type of scenario. Topps must have had an outside vendor cast these. I am also advised they are quite light and do not have the heft of a regular coin.